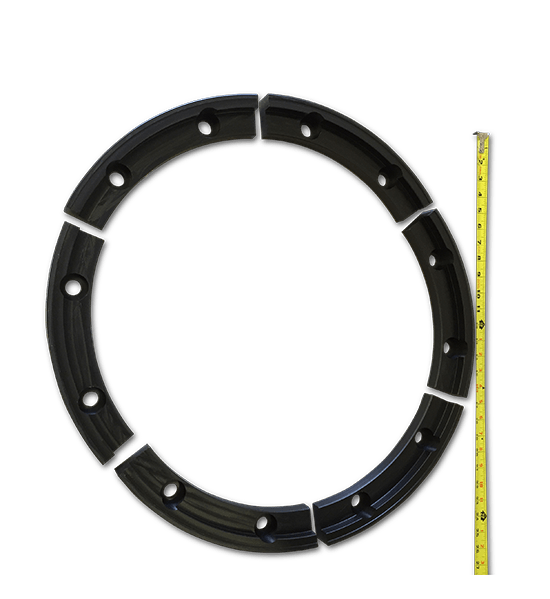 A machine builder needed an oversize wear ring machined to very tight tolerances and rugged enough for continuous use in an extremely hostile environment. We speced 1-1/2 inch-thick UHMW sheet for this application. UHMW has an excellent combination of physical toughness and very low surface friction. The machine parts rotated against each other for thousands of cycles without incident. Further, we machined the wear ring in six individual segments to maximize material yield. Form follows function for the win! Our UHMW wear rings have provided our customer with thousands of hours of maintenance-free operation. Cutting the wear ring as smaller segments improved material yield and reduced the per unit price dramatically.